Dell is available to do author visits to schools and also can talk to adult groups about her writing and her books. She can also take Gifted and Talented students for a creative writing workshop. Dell is a retired teacher. She has current clearance from the NSW Department of Education and Training to teach and to visit schools. She will need an hour to speak to each group but can speak to up to four classes at once (though smaller groups are better). 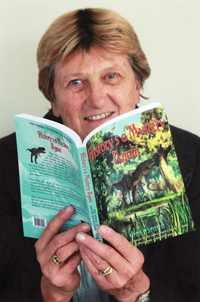 Since her books are suitable for 9 -13 year olds, Years 4 – 7 are age appropriate. However, she is an extremely busy person and needs a great deal of forward notice to fit a school visit or talk into her tight schedule. She also travels a lot so you may have to wait quite a while for her to visit. If you would like to arrange a visit/talk from Dell fill in the form below. Please state WHERE the visit is to take place, and be flexible with your dates.